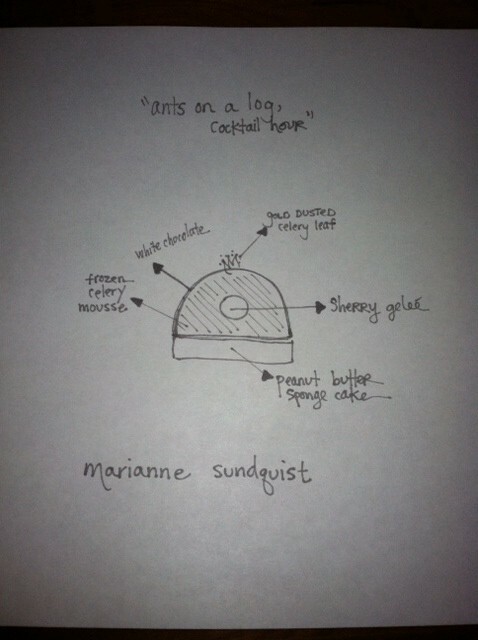 Marianne Sundquist's "Ants on a Log, Cocktail Hour"
Conlon: "Nico [sous chef], I might need you to scrub this pork uterus." Conlon: "I burnt the uterus. And it's important. Take out the least burnt, and just kind of clip it off. Try to keep it intact as much as possible." Nor do we have any idea what most of the 26 chefs recruited for the Key Ingredient Cook-Off will come up with—but we have been given a few sneak peeks. Mess Hall's Marianne Sundquist, whose original installment showcased pork cheeks, sent us the sketch above, her blueprint for a truffle-size bite featuring celery, her assigned cook-off ingredient. "Ants on a Log, Cocktail Hour"—which suggests the latter with a center of sherry gelee—will have a base of peanut butter sponge cake, topped by frozen celery mousse coated with white chocolate, and garnished with a celery leaf dusted with gold—another ingredient used in the series. Paula Haney and Allison Scott of Hoosier Mama Pie went all out their first time around, experimenting with millet until they'd come up with two dishes: a hand pie with beer-soaked millet and millet tabbouleh and a parfait with creamy millet pudding topped off with salted chocolate millet bark. This time Haney and Scott, working with dried shrimp, have devised a chawanmushi (steamed egg custard) with dried shrimp, porcini mushrooms, midwestern kimchi, and dried-shrimp kettle corn. Haney's only question: "Do you need a shorter name?" Last we heard, Matt Troost of Three Aces, who originally got the Brazilian staple dende oil, was planning to put a twist on his new ingredient, Jeppson's Malort, by braising pig face in the wormwood-based spirit to make his very own Malort Face. The Key Ingredient Cook-Off is Friday, May 3, from 7 to 10 PM (6 PM start for VIPs) at the Bridgeport Art Center, 1200 W. 31st; tickets are $65 ($100 VIP), available here.